The Icom IC-706 in all it’s versions is one of the best know amateur transceivers of the last 20 years. Originally released in 1995 with the last in the line being the IC-706MKIIg which last rolled off the production line in 2009. I managed to pick up a MKIIg a while ago in excellent condition which appeared to be fully functional as Icom intended it apart from problems with the microphone I posted a short note about a while ago. After I fixed the microphone issue I made a few good DX contacts on 20 and 12m. I was getting a good impression of the shack-in-a-box and was looking forward to taking it out for portable VHF contesting which is what I bought it for. Unfortunately it wasn’t 100% as intended though as a fault which was addressed in a service bulletin from Icom back in 2002 appeared. 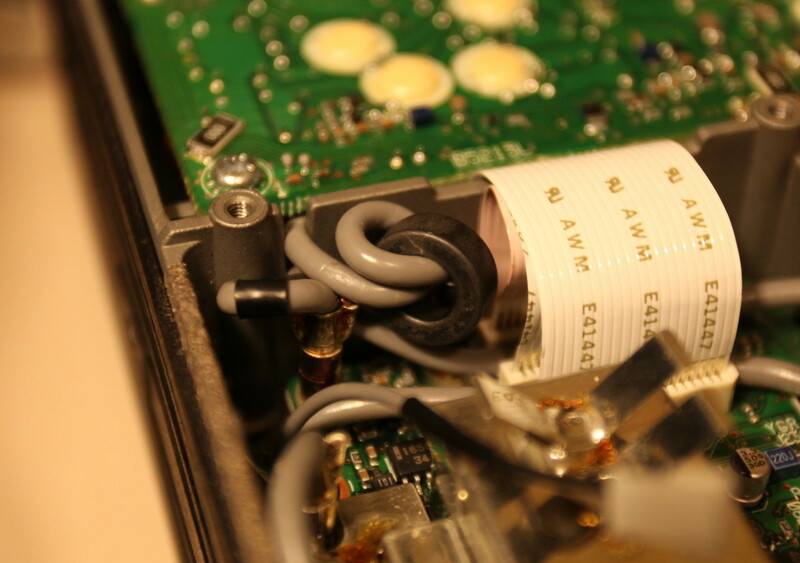 Long story short the final amplifier goes into self oscillation when transmitting in any mode on 15 or 17m. The rig transmits correctly into a dummy load or perfectly matched antenna but if the wind is slightly up hill the visible effect is that SWR pops up to infinity because the final amplifier is generating a carrier somewhere out of band. A quick google revealed the Service bulletin along with a bunch of forum posts about successes and failures in fixing the issue. 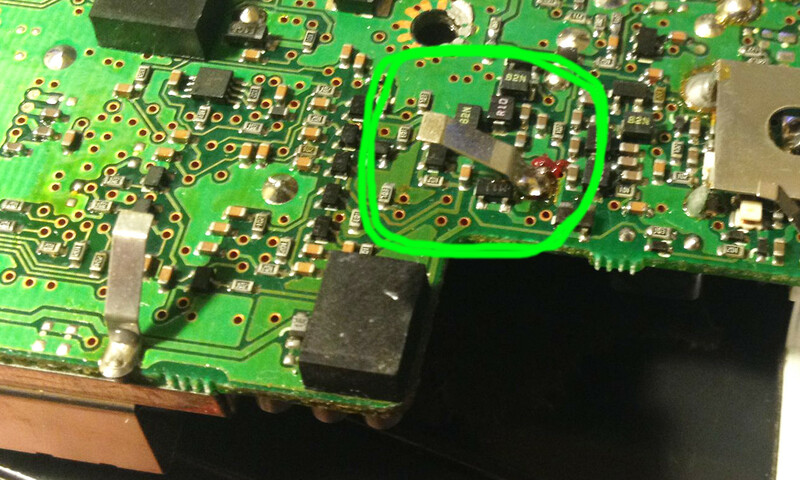 The recommend repair from Icom involves improving the earthing of the PLL and filter boards. 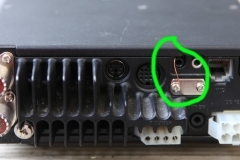 The factory earthing is some wee spring contacts that touch the aluminium chassis in various places and the screw-down points for each of the circuit boards. These springs slacken with time I imagine and some received a new spring ‘MP6’ on the filter board as part of the service bulletin. 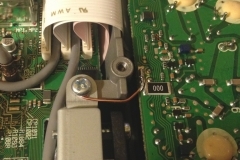 My example had the ‘new’ spring on the filter board but another one on the rear side of the PCB was visibly not making a good contact at all. On the filter board I replaced both the ‘new’ contact (MP6) and the obviously faulty one (MP4) with solid copper wire links to chassis. With the filter board out I also re-tinned all of the mount points and cleaned the surface of the ‘posts’ they screwed down to. On the PLL board one of the spring clips came away from the board due to a dry joint when I tried to re-tension it but otherwise the contacts appeared to be sound and I stuck the whole thing back together with great expectations. Unfortunately my great expectation turned to greater disappointment as I could still not transmit on 15 or 17m into my Hexbeam which is by all accounts a good match on both of those bands. Oddly enough I could now key up if the lid was off the case so I had at least changed the fault, but not fixed it at all. Clearly there is something critical in the RF deck that does not like stray RF back into the first IF / mixer section of the rig on those bands. About now we’ll go for the ‘long story short’ option. I took the rig apart a few more times, added more earthing and generally tried random things and did actually manage to have one QSO on 15m with a JA station with the lid off but a fix based around the service bulletin was not even in the ballpark for my example. That matches up with some very frustrated forum posts I found which starting to cause me some concern as I only really bought the rig to prove or disprove it’s performance on 2m SSB during a contest and selling the rig on fairly quickly was part of my grand plan for not filling my small shack with rigs I don’t use very often if it wasn’t up to the job on VHF. 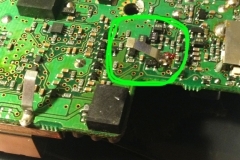 Somewhere along the way I’d emailed a local ham who does some repair work asking about the problem and we’d had a bit of a conversation about the problem during which he suggested a ferrite choke between the mixer/modulator board and the filter to stop the feedback in it’s tracks. I’d run out of things I could earth and it’s one of those suggestions that makes so much sense you wonder why you didn’t think of it yourself. Many thanks to Tony, ZL3HAM for pointing me in the right direction as without him I’d be pondering what to do with an all-band rig that didn’t work on two very useful HF bands. 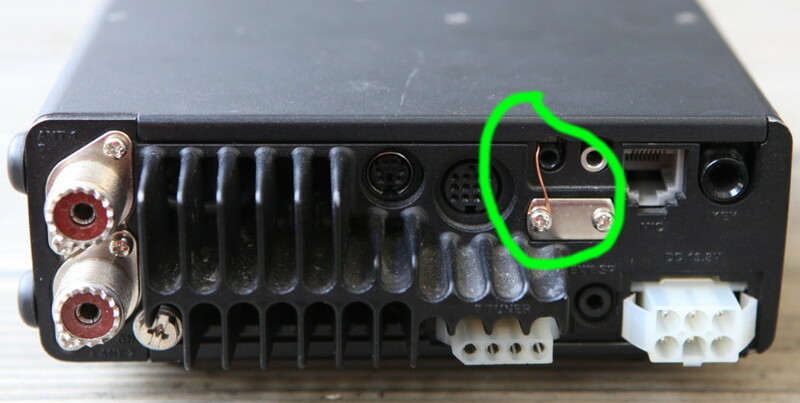 I validated the idea by un-plugging the coax between the filter and mixer board and transmitting on 15 and 17 into the hexbeam at full power and it worked fine. Listening on another rig the modulation sounded fine and aside from the rig being effectively stone deaf it worked. That started a hunt through my junk boxes and misc cables for a suitable donor ferrite that I could get one turn of the annoyingly rigid internal coax through and still get the lid closed. The one that finally presented itself came from the power lead on an LDG tuner that could quite happily survive with a much larger one and I set about threading the coax through the proverbial needle. The thin grey coax they use in rigs between boards is interesting in that it is quite rigid for it’s size and has crimped connectors I’d have no show of replacing if I chopped it off so I had to gingerly trim the ‘wings’ of the crimp to fit through the hole in the middle of my little metal oxide donut. 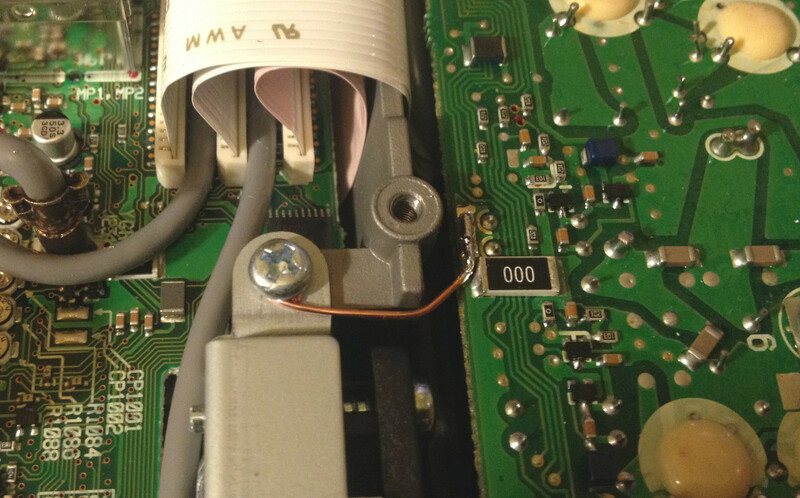 Once through the first time getting one turn on the thing and still reach the connector on the board while allowing the lid to shut was a long painful process which would not have been much harder if I tried to do it wearing leather welding gloves. The effort paid off though and I can now key up on 15 and 17m into truly lousy antennas and the rig folds back the power as it should but remains steadfastly on the set VFO frequency. Hopefully someone else will find this article useful when they find their rig doesn’t respond to the ICOM prescribed fix. I understand in a lot of cases the earthing fix does work and that should be your first port of call. It was the combination of earthing and the ferrite that fixed mine. Footnote: I actually wrote this article in 2014, but never got around to posting it to my blog. The rig did good service for a year or so before I sold it on as I had too many in the shack.